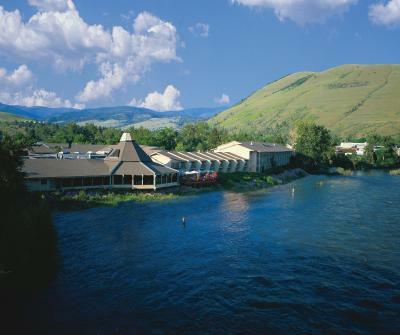 Lock in a great price for DoubleTree by Hilton Missoula Edgewater – rated 8.2 by recent guests! Food was exquisite. Crepes were great! Bed mattress was one of the best I’ve slept on. Staff was very friendly, welcoming and helpful. The first time I’ve ever seen a Wall Street Journal. The location for us was the best ! The beds were great ! Staff was very friendly! My son loved the warm cookies and so did my husband and myself ! Recently redecorated the room felt modern but had a nice western vibe. Nice shower, bed was comfy. The room had plenty of space for our 3 adult party. The staff could not be friendlier or do enough for you. Nothing was an imposition. My husband surprised me with flowers and the hotel graciously offered a vase while we stayed there. The housekeeping staff was amazing and did an impeccable job. The location is the highlight. Along the Clark Fork River ( yes, the same one we could not see from the room) there is a walking and biking trail system that leads to tge downtown park area where there are excellent restaurant and shopping options just 2500 steps away from the hotel property. We discovered nature areas, breathtaking river views, a park concert and brewfest, and a farners market over the course of our 2-day stay for a wedding. Also, there are some very excellent restaurants that we discovered. The walk is easy and flat with a plethora of interesting people and sights along the way. That's the best part of this way over priced property. Location along the river was nice. Beds were comfortable. It is a beautiful property located on the river. I could watch people fly fish from my room deck. The restaurant is eexcellent with very accommodating staff. Outstanding staff, extremely friendly and accommodating. Spotless roooms, super bar and restaurant overlooking river, pool and exercise room, centrally located. Rooms spacious and comfortable. Would not hesitate to recommend or return. Thank you Swen and staff for a perfect stay at Doubletree. The location was perfect for me and the reason for my visit. So much within walking distance. The beds were comfortable, room was clean, and I loved the big windows looking out to a smallish patio. Very pleased for the most part. DoubleTree by Hilton Missoula Edgewater This rating is a reflection of how the property compares to the industry standard when it comes to price, facilities and services available. It's based on a self-evaluation by the property. Use this rating to help choose your stay! 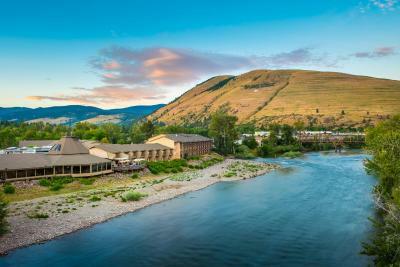 This Missoula hotel is located next to the scenic Clark Fork River. The hotel offers free shuttle service to and from Missoula International Airport and an outdoor swimming pool. DoubleTree by Hilton Missoula/Edgewater features 37-inch flat-screen TV and free Wi-Fi in every guest room. Some rooms offer a balcony or patio and views of the river. Guests can enjoy the modern gym and jacuzzi at the Missoula/Edgewater DoubleTree. A 24-hour business center is also available. Finn and Porter restaurant serves Northwest cuisine including steaks and seafood. Room service is available. When would you like to stay at DoubleTree by Hilton Missoula Edgewater? This room features a seating area, a TV with cable channels and tea and coffee-making facilities. Each private bathroom is equipped with a hairdryer. This room features river views, a balcony, a sitting area, a TV with cable channels and tea and coffee-making facilities. Each private bathroom has a hairdryer. House Rules DoubleTree by Hilton Missoula Edgewater takes special requests – add in the next step! DoubleTree by Hilton Missoula Edgewater accepts these cards and reserves the right to temporarily hold an amount prior to arrival. The pool was outside and there was no hot tub. We had to walk outside through the snow to get to the main building. Value. Cleaners forgot coffee creme and other details. Shower valve in terrible state of repair. General state of detail. no way to control temp in room except open window. We were on ground floor and it is sliding glass doors so ?? safety . There only pool was out doors so closed for the season. Had a grandson that had been looking forward to the pool. Would rather not have been on the 1st floor, upstairs was noisy! Our shower changed temperature every 2 minutes or so, not sure what that was about! Would have loved a mini frig. in the room! And a small continental breakfast would have been wonderful as our son was part of a Conference at the U of M and had to get there early! But that was not a real deal! We used to stay here quite often when our son was in school here and went to a few fun weddings here, so we do enjoy this hotel ! The hotel is on the river, but we were facing the parking lot. The hotel's central HVAC units were located just outside our room. There was a constant droning of equipment not much quieter than a 737 warming up on the tarmack. The hotel was grand at one time, but like the inevitibility of erosion, the flower has faded. The owners, it seems haven't accepted that reality and adjusted the pricing to reflect. The only disappointment with the property is that the jets in the hot tub did not really work. While the water was hot, it was more like sitting in your tub due to the were weak and ineffective jets. The staff quickly called the engineer and he came and talked to us. Sadly, he said, the jets hadn't worked in awhile. We appreciated everyone's expediency and honestly, though. The hotel rooms needs to be updated. We found cherry pits, dried fruit and some other foods on carpet. We reported it to two different staff members who said that they would get it taken care of, and did not. We also had a large tray of half-eaten food left on the floor outside of our room, and requested that it be removed after seeing it there for several hours. Again, it wasn't removed. A/C in gym didn't work and it was HOT!